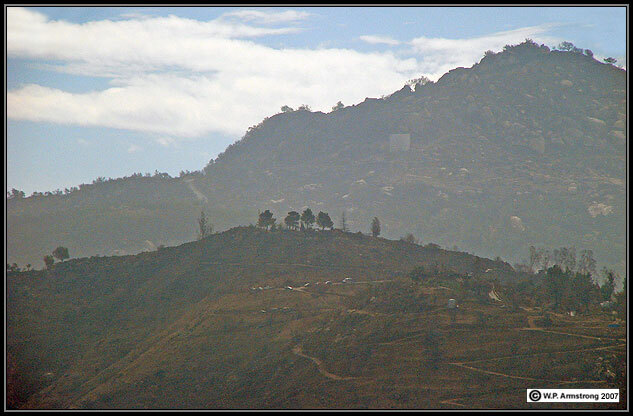 Image taken from hillside in San Marcos looking south toward Escondido. Fanned by strong Santa Ana winds with gusts up to 60 mph, this fire swept westward from Witch Creek east of Ramona to Escondido within 8 hours. 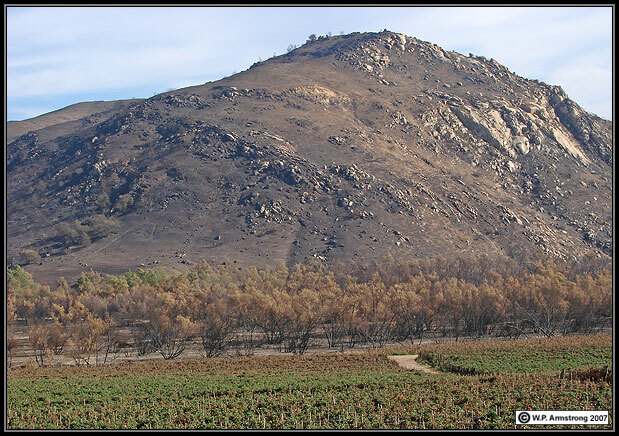 The fire essentially followed canyons and hillsides along the general route of the San Dieguito River. It jumped across I-15 south of Escondido and moved into the hillsides bordering Lake Hodges. From here it raced through the hills and canyons west of Escondido on its way to the coast. The fire burned almost 200,000 acres and destroyed about 1500 homes. See next image to see the extent of the smoke cloud blowing over the Pacific Ocean. Embers from fires driven by high winds can start fires up to 1.5 miles away from the "front" of the fire. 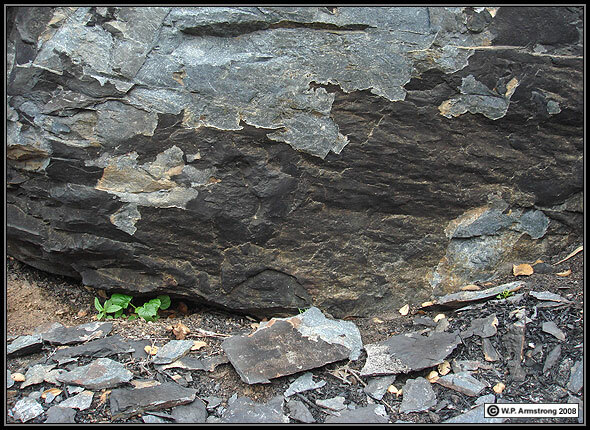 These spot-fires spread in the direction of the wind, and in turn can start new spot fires in whatever direction the wind is blowing there. Everytime you hear that a fire "jumped" the I-15 freeway, this process was at work, since the concrete freeway doesn't burn. I-15 is an 8 lane freeway with a width of 400 feet, greater than the length of a football field. One house in Escondido destroyed by the Witch Fire was 2 miles from the nearest blaze, and yet it caught fire and was gutted without warning. Please refer to: Richard W. Halsey 2005. 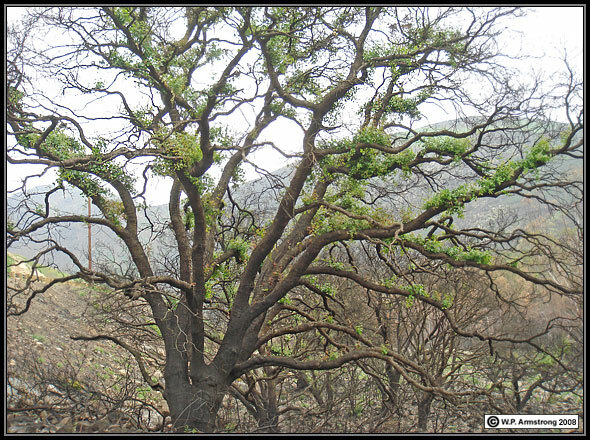 Fire, Chaparral, and Survival in Southern California. Enhanced NASA image showing the wind-blown smoke cloud (red) from the Witch Creek Fire. 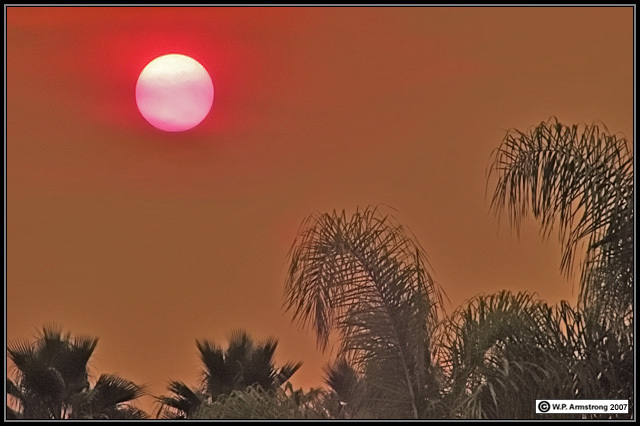 Late afternoon sun glowing through ash clouds over San Marcos. San Pasqual Valley east of Escondido showing tomato fields in the foreground. 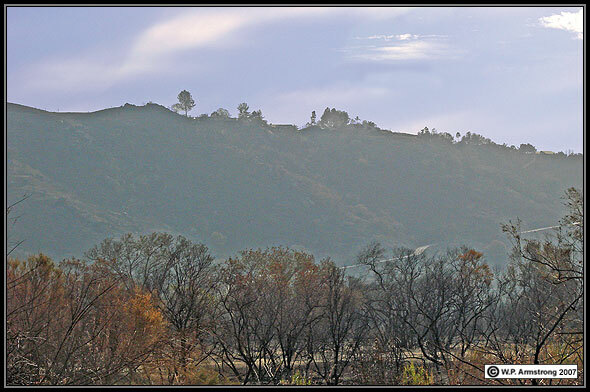 The riparian woodland along the San Dieguito Riverbed and distant hills were burned in the Witch Creek Fire. This was an intense, fast-moving fire, particularly on the steep chaparral slopes. The fire also swept through the understory of willows and cottonwoods. Deciduous leaves of the latter trees and shrubs were singed and killed from the heat. Rows of tomato plants nearest the riverbed were also killed. Hazy (smoky) view from the San Dieguito Riverbed looking south toward Highland Valley. Numerous beautiful homes along the distant ridgetop overlooking San Pasqual Valley were destroyed by the fast-moving Witch Creek Fire. In fact, two people died in their garage when the flames raced up the ridge too quickly for them to escape. Two of their neighbors survived by jumping into their swimming pool for three hours. Another neighbor drove along Highland Valley Road through dense smoke and fire to escape from the flames. Another hazy (smoky) view of the ridge bordering Highland Valley. The burned trees show where several beautiful homes once stood on this site. 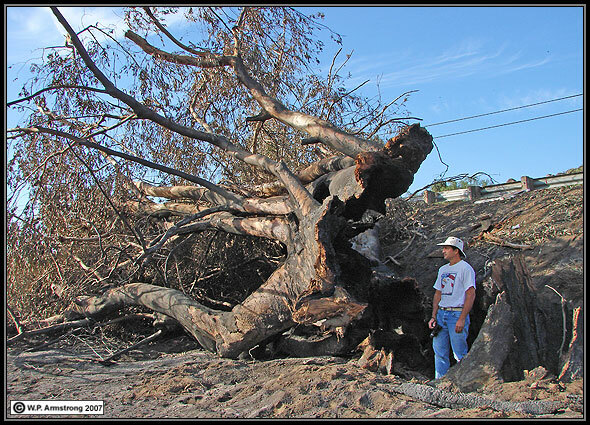 A massive, old eucalyptus tree (Eucalyptus camaldulensis) in San Pasqual Valley destroyed by the raging Witch Creek fire of 22 October 2007. 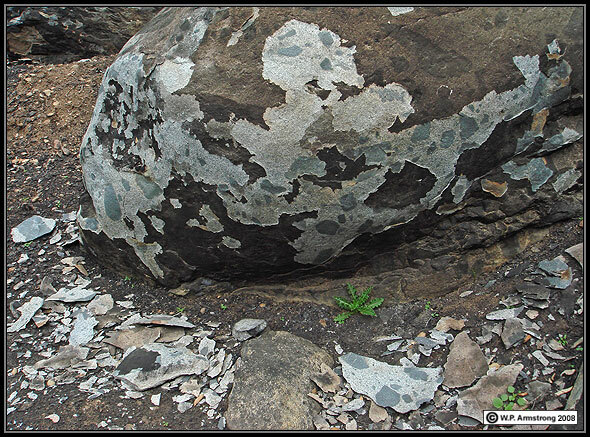 Exfoliating boulder of Santiago Peak Metavolcanic. 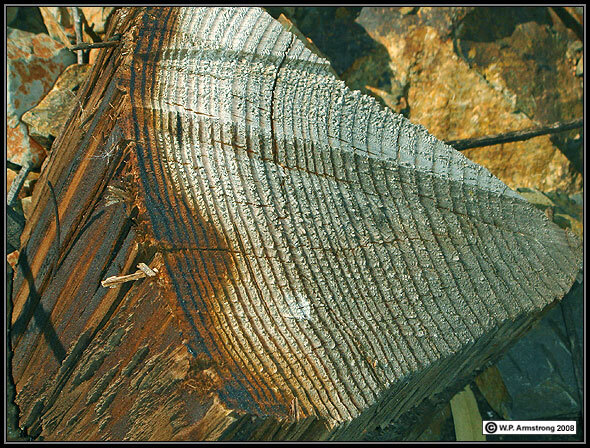 This charred log has 36 annual growth rings. 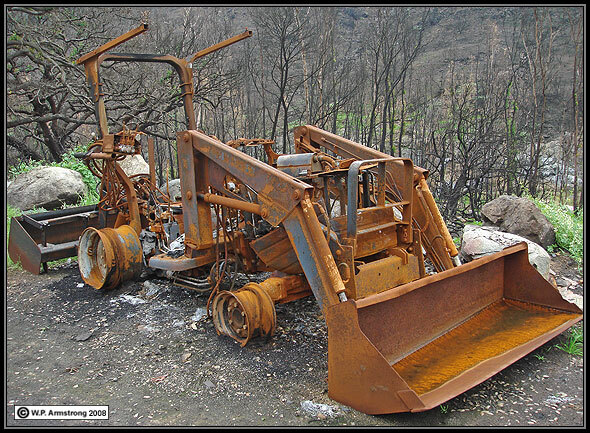 An unfortunate tractor that was working along the San Dieguito River. Coast live oak (Quercus agrifolia) resprouting from its branches (epicormic). 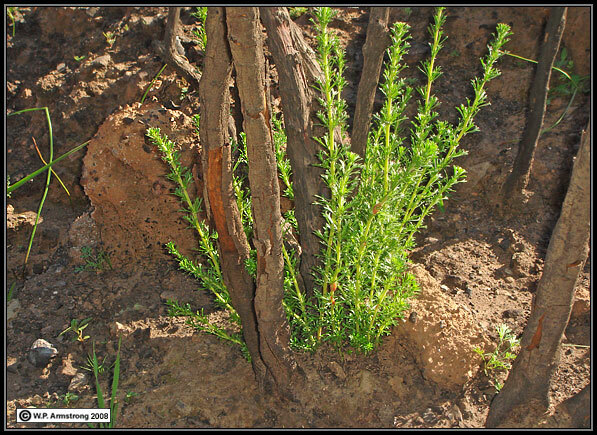 Chamise (Adenostoma fasciculatum) resprouting from lignotuber. This is not snow along Del Dios Highway. It is hydromulch containing wood fiber sprayed along the recently burned slopes to reduce erosion. The burned shrubs in photo (mostly Ceanothus tomentosus var. 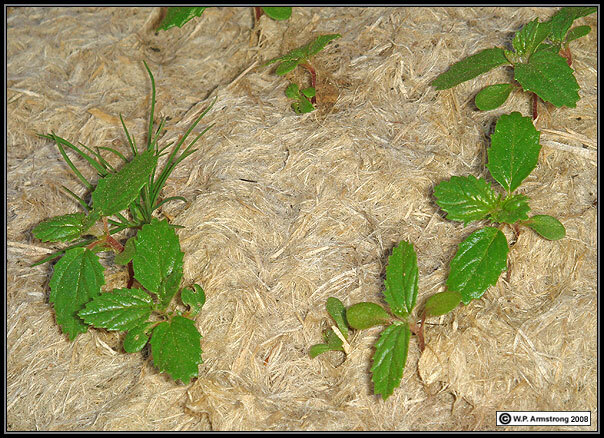 olivaceous) are reseeding in the fiber mulch (see next image). Seedlings of Ceanothus tomentosus var. 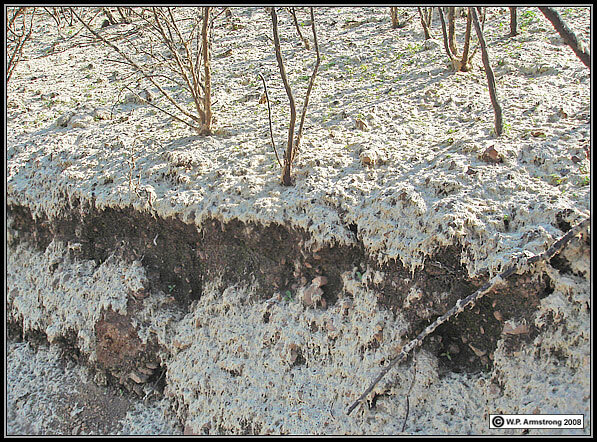 olivaceous growing through a layer of fiber mulch that was sprayed along Del Dios Highway after the Witch Creek Fire to reduce erosion.